19th century tan morocco with small B (for Beaupré) stamped in the center of each cover; lettered: Heures. Bookplate of Beaupré, antiquarian of Nancy, 19th century; bought Oct. 22, 1896 by Richard Bennett; his Catalogue, no. 43; purchased by J. Pierpont Morgan (1837-1913) with the Bennett Collection in 1902; J.P. Morgan (1867-1943). 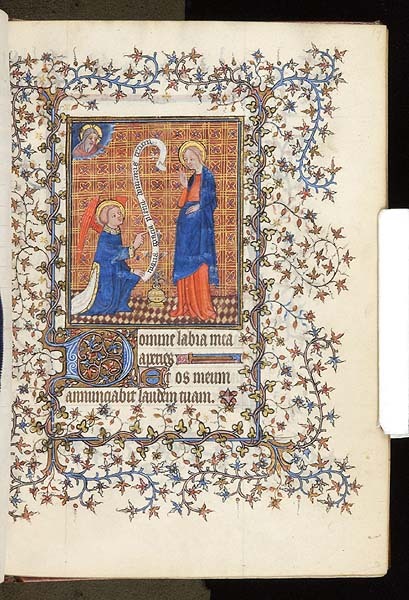 Ms. book of hours for the use of Paris (Hours of the Virgin); written and illuminated in Paris, France, ca. 1390-1400.